What comes between C and D? Last week I discussed middle-seat etiquette, this week I want to take a look at the common space on board the airplane. Lets talk about the rules about the aisle. As you stand up to exit your seat, do not pull on the seat back which belongs to the person in front of you. You didn’t pay for that seat, so you do not have the right to touch it. There is nothing more terrifying than your seat back being pulled back while you’re sleeping on the plane. Now that you are standing in the aisle without touching the seat of the person in front of you, you have to walk to the washroom without touching the seat backs of anyone else’s seat. See above regarding the fact that you didn’t pay for the right to touch their seat. If you do need to brace yourself, the overhead bins make a great hand rail. If you cannot reach, then do your best to touch as few seats as possible and be certain to apologize for intruding on someone else’s space. How do you pass another person in the aisle? The most preferential way is to step into an empty seat. However, that isn’t always possible. In that scenario, the rule that flight attendants use is “cheek-to-cheek.” In other words, back-to-back. This is the least awkward way to pass in this narrow space. If you are waiting for someone else to finish up in the washroom, do not lean on the seat-back of the chairs. Having a seat near the bathroom is bad enough with the noise and smells that adding people standing in your seats is crossing the line. What happens if the person trapped by the window or middle seat needs to get up to use the washroom 100 times during the flight? You’re going to have to get up each and every time without complaining. This is the price of the aisle seat. Most importantly, you are certainly not going to force anyone to try and climb out over top of you to make their escape. Do you have any other rules that you would add to travelling in the aisle seat? Let me know in the comments below. 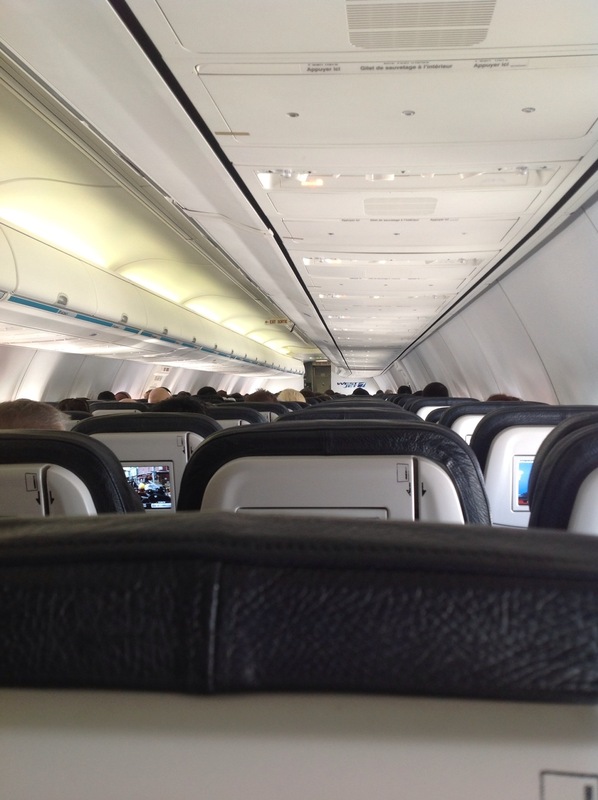 This entry was posted in Travel & Transportation and tagged 2013, airplane, aisle, etiquette, rules, transportation, travel. Bookmark the permalink. ← Have you scored recently? Matt, you do realize that some people might find it hard to maneuver through a moving plane without touching someone else’s seat? Absolutely, I agree. Something’s such as mobility issues can make moving in the narrow spaces of the aircrafts challenge. I think my point was that you should make as much of an effort as you can not to touch other people’s seats if you can avoid it.